A new home for the Long Now Foundation. When The Longnow came to us with the desire to redesign their space, we jumped at the opportunity. In the 1930’s, it was a blacksmith shop. Now, it is a pedantic cafe in the daytime that transforms into a bar & oratory venue at night. We've designed the space to include a cerebral museum, an office on the upper level, and a showpiece of curiosities and gadgets pertinent to The Longnow projects. A view from the font doors, we put the beautiful prototypes from The Longnow in prominent places for display and to become usable gathering spaces. The stunning prototypes from the Clock of the Long Now like the Orrery, stand as a tall anchor at the entry. The two-story bookshelves beyond and the bar in the back draw people inside to this cozy space. From our Architectural set for construction, these plans show the two floor construction of the interior and how all the elements will be arranged. This drawing shows our concept for the floor to ceiling bookcases, how they would funtionally work in the space and look from the exterior windows. Initial concept renderings for the project look almost identical to the final construction. This rendering was done very early in the concept phase. The final construction complete and the doors open for business. The hanging bottles catch the light of the LEDs we've suspended from the ceiling. Specially-designed hangers for earthquake country securely hold this laboratory flask glassware in place. Your purchased bottle lives nestled above the bar. 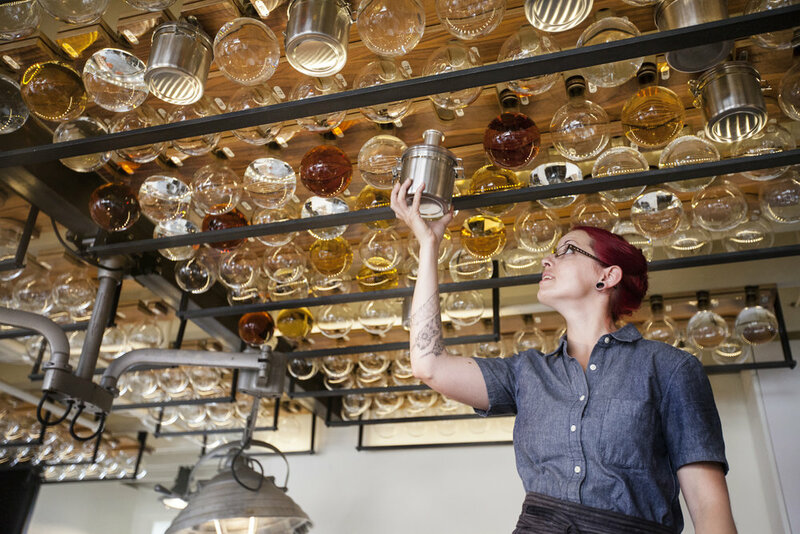 We've integrated the bottle into the ceiling lights that hang from the steel gantry over the bar. In the bar drip tray, we designed a custom Longnow logo among the drainage. 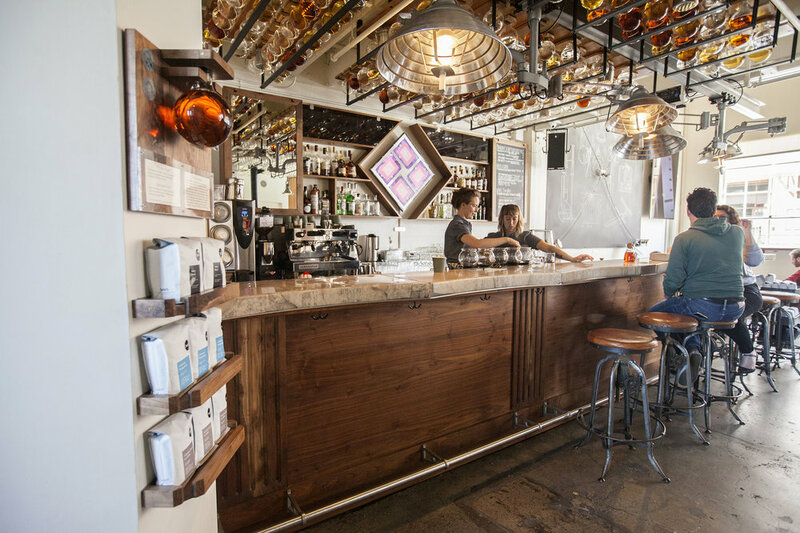 Specially sourced, locally-harvested California walnut hardwood and custom foot rail add to the beauty of this bar. 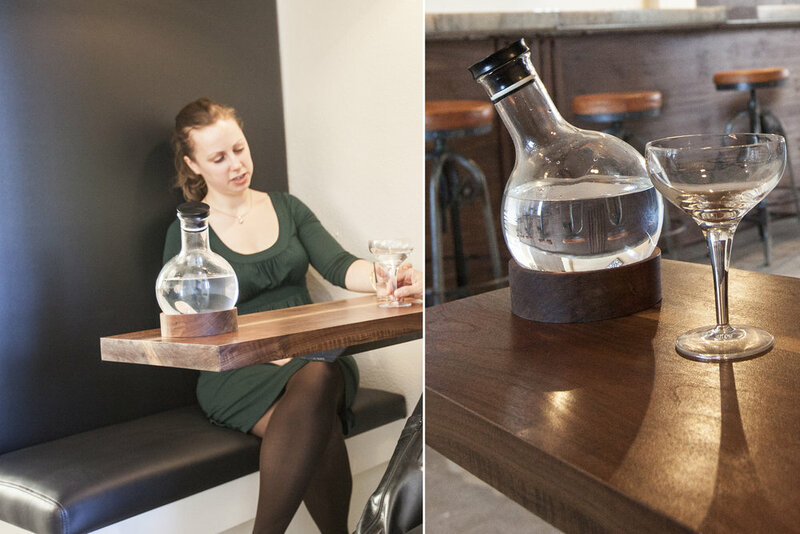 The bar top, a resin pour over slabs of sandstone, pieces saved from the Longnow Clock site in Texas. A small room in the back of the space, now built our with wrap around cushioned seating. Look up and you will see a photo of the hole drilled into the mountain at the Longnow Clock site in Texas. The space fluctuates to suit various needs; by day The Interval serves artisan tea & coffee; and by night, specially made cocktails. The Interval also hosts live events and activities for their members and the public. 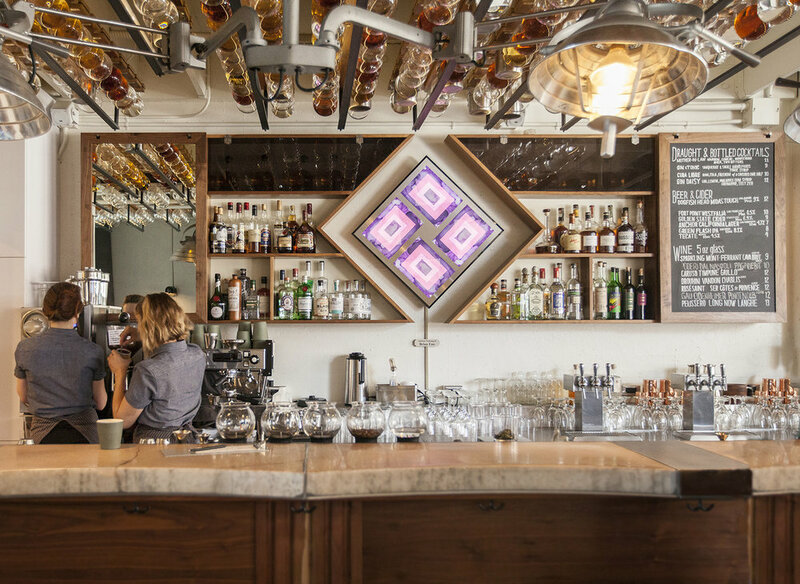 Originally the blacksmith and machine shop for Fort Mason, our design brings a modern spirit to the 1930's era history of the space. 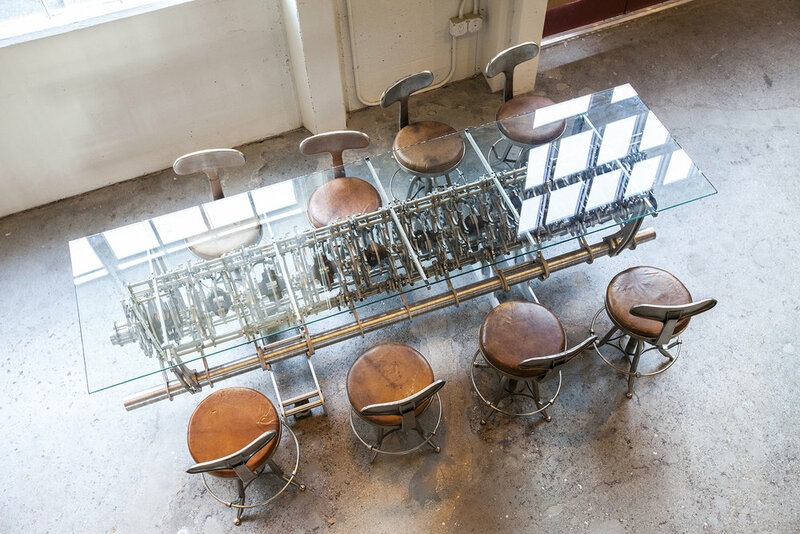 Vintage stools and historic concrete floors speak to the original machine-shop space of the space. While a palette of leather, walnut, and metal bring the 30's into focus, as the modern artifacts of the Long Now bring us into the present. 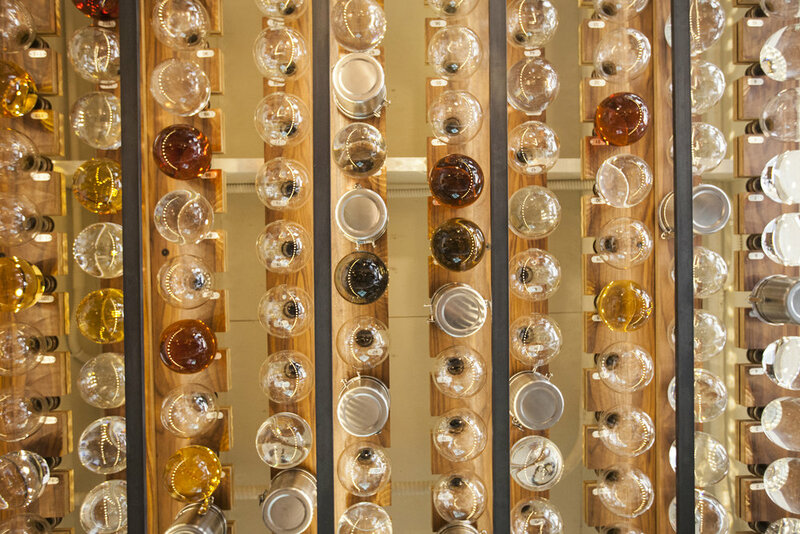 Directly above the bar hangs an intricately designed ceiling storage unit for The Interval’s bottle club program. We designed and fabricated the ceiling mounted bottle holders, which in the night become illuminated from above, casting a twinkling, glowing effect among the bottles. In our fabrication shop, the bottle hangers are made and individually numbered. On site they create a lush density that beautifully plays with the light. Limestone from the Clock Test site was cast into resin at our shop to make the bar top. The curves in the stone are from the Clock site carving. We were excited to use these to add a wonderful edge to the bar front and beautiful surface. An early design for the bottle hanging system. Our fabrication details for the bar construction. 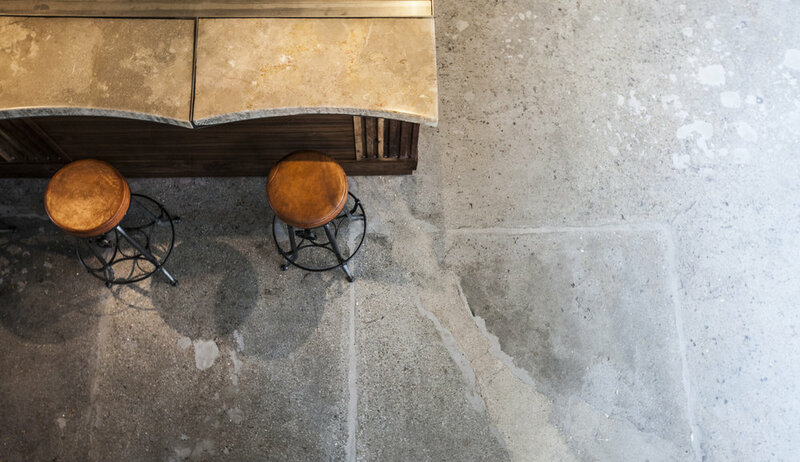 Complementing the floor original concrete floors that celebrate the space's history, a limestone bar top encased in resin. 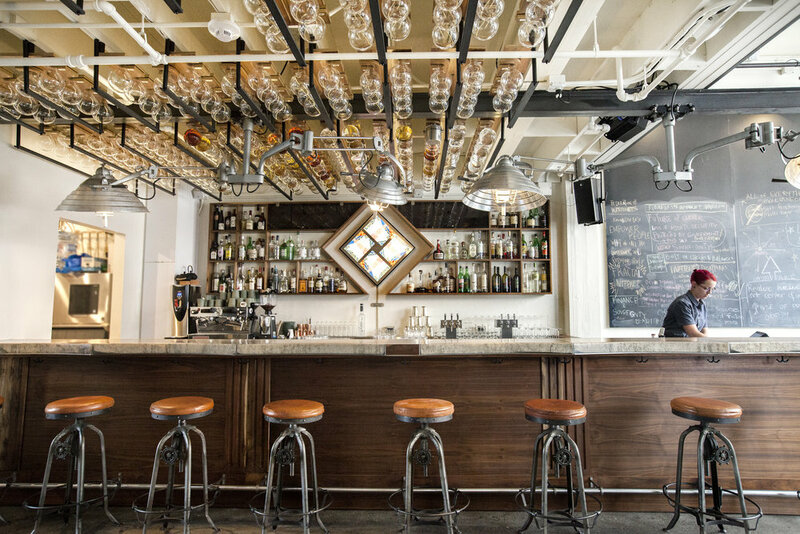 Bringing out the beautiful raw details of the stone, tt also provides a durable surface for the bar and cafe patrons. Our 'wunderkammer' build in under the stairs. 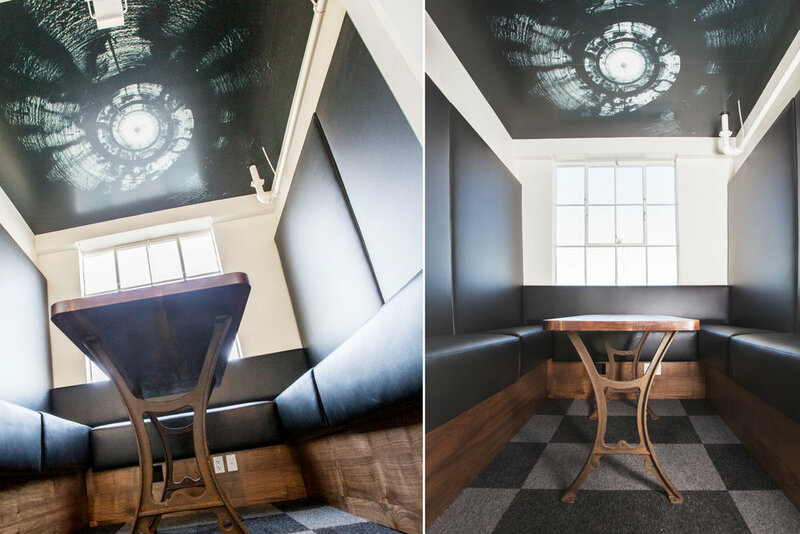 Just another space saving design that adds a richness and discovery to the space. Used to display artifacts from The Longnow's projects, details about their programs and items for purchase. Locking drawers below hold back stock. Fitting perfectly into the stairs, we used a 3D scan of the circular staircase to create this build in cabinet, so install was fast and simple. The top of the stairs leads to the floor to ceiling bookshelves, revealing that one of the bookshelves opens (a secret door!) into the office upstairs. 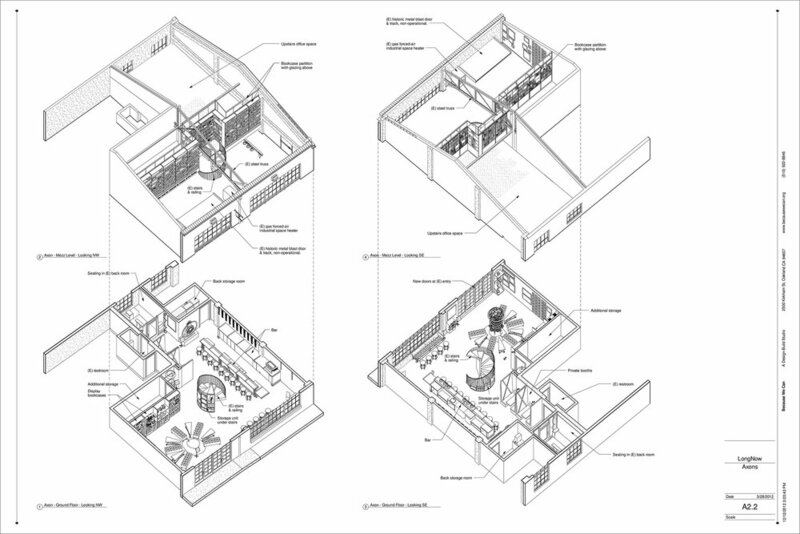 Floor plan of the upstairs office, we allowed flex space and floating desks in this small office floor plan. Looking form the top of the stairs, one can see the Chime Generator, an artifact from the Longnow's projects, turned into a glass top table. 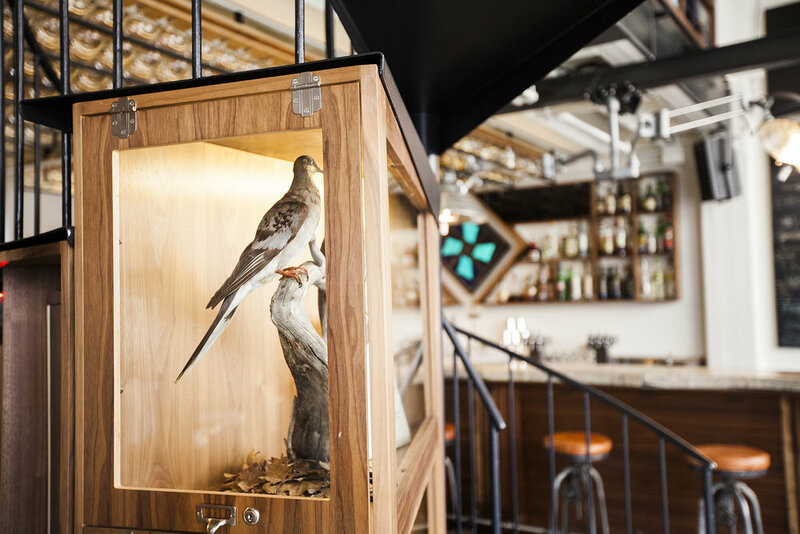 We turned this Chime Generator from the Longnow's projects into a table, another space saving design idea in this small bar. Thick walnut slabs caneleiver from the wall to create tables. The chalk board robot in the background, used for conversation provoking decoration during most hours, and a back drop for the venue's ongoing talks at special evening hours. We let the history of the space drive the design. Once a blacksmith shop in the 1930’s, we focused on renewing the original character of the space. We stripped the drywall and industrial carpeting to reveal the authentic stone slab flooring. 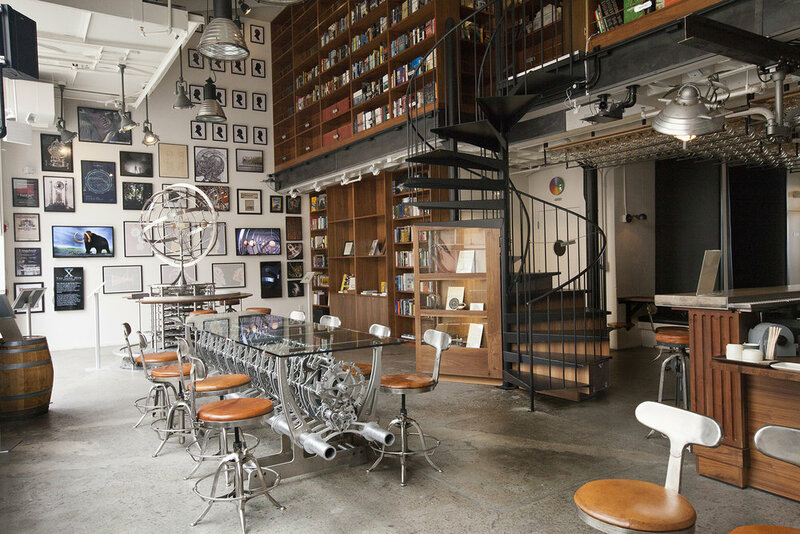 Due to the small size of the location, we designed clever space saving ideas, like the chime generator prototype that is now also a dining sized table, and a spiral cabinet built into the staircase, floor to ceiling bookshelves to also help with noise, bottles hung from the ceiling and built in booth seating. Many odd & fascinating artifacts adorn the space in a museum-like fashion, to emblazon The Longnow's projects and mission. 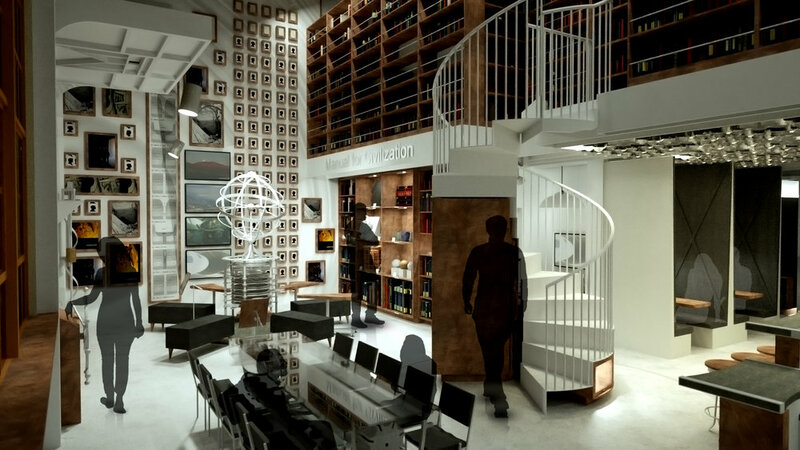 Bookshelves ascend to the ceiling, providing a necessary separation for The Long Now's mezzanine offices and the public areas below. The bookshelves hold a collection of books that The Long Now has been acquiring since its beginning. Our bookshelf design even helped spur another project that The Long Now has since started: a project to select 3,500 books that could help sustain or rebuild civilization, called the Manual for Civilization. Purchase a bottle of amazing spirits and help fund this non-profit!